Wisdom teeth are a frequent source of problems for people. The reason is that there usually isn’t enough room for them to erupt into the arch normally. And sometimes, even when there is enough room, they become oriented horizontally. Either situation will cause them to become impacted, meaning that they are impeded from normal eruption. When they don’t erupt normally or it can be predicted that they won’t erupt normally, my advice is to have them removed at your earliest convenience. Some people put this off, thinking that if their wisdom teeth aren’t bothering them they should leave them alone. The reason this is unwise is that complications from wisdom tooth surgery multiply with increasing age. If you wait until they bother you, the extractions could be very difficult with serious risks of complications. If, however, they can be removed in the late teens or early twenties, complications are much milder and less likely to occur. Also, when they do start to bother you, wisdom teeth can be a source of serious, even life-threatening infections that can swell to close off your breathing or can spread to your brain. Why take those chances when wisdom tooth removal at a young age is such a routine procedure? An impacted wisdom tooth. This x-ray shows a cavity forming on the second molar where the wisdom tooth is touching it. 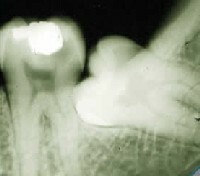 Problems like this are common with impacted teeth. My estimate is that you’ll see twice as many complications at age 30 as at age 25, twice as many at 35 as at 30, and twice as many at age 40 as at age 35. Although I was a general dentist when I was in practice, I enjoyed oral surgery and only referred out impacted wisdom teeth on rare occasions, when the patient’s age and potential for complications was exceptionally high. If they were over 40, for example, I knew they would have post-operative trouble and I wanted them to have that in some other office, not mine. My incidence of complications from this surgery was low. For example, even with removing hundreds of impacted wisdom teeth, we did not see a dry socket (a common healing complication after the extraction of wisdom teeth) in our office from 1990 until I retired from active practice in 2002. In dental school, I was awarded the oral surgery award of the American Association of Oral and Maxillofacial Surgeons for my graduating class. An impacted tooth is one that is prevented from erupting into the mouth normally. And impacted teeth are a risk factor for problems such as tooth infection, tooth abscess, cyst formation, or damage to adjacent teeth. The removal of impacted teeth is an operation. It requires incision of the overlying tissue and often the removal of bone to be able to extract the tooth. The tooth may have to be sectioned. Take this operation seriously, and plan for a couple of days’ rest afterward to promote good healing. The area around the surgery will swell considerably and will be very sore. This swelling will make it hard to open your mouth for a few days. You will probably need to take pain medications for about two to five days afterward, depending on the extent of the surgery and your body’s response to it. Plan on a diet of soft foods for up to a week. You will also experience general body weakness for a few days. Your dentist may provide you with instructions on how to cleanse the area of the surgery, how to control abnormal bleeding, and other aspects of post-operative care. Follow these instructions carefully for best healing results. If your own dentist hasn’t done that, here are some instructions. Rest. Avoid any physical exertion for the rest of the day. After today, listen to your body. There are great variations in the amount of rest you will need until you heal depending on your age, the amount of bone that was removed, and your own individuality. If you begin to be active prematurely, you may experience increased pain in the area of the surgery. Watch for bleeding. Some oozing of blood is normal for the first couple of days, and you will have blood-tinged saliva for that time. This is normal. But if there are dark red clots of blood in your mouth, that isn’t normal. If your dentist has given you gauze, use that and bite on it while you lie still for about forty-five minutes or so. If you don’t have gauze, use a folded-up paper towel—anything to put pressure on the surgical site. If that doesn’t take care of the bleeding, increase the time. If bleeding persists, call your dentist. Take any medications that have been prescribed. Pain medication should be taken as needed, in other words, take it only as often as you need it to control the pain. If you find the pain medication inadequate to control the pain in the dosage prescribed, call your dentist. Eat soft foods the day of the surgery. Gauge your return to normal foods by how your mouth feels. If it is hard to chew, don’t push yourself, but continue to eat soft foods until you can comfortably handle normal food. And be sure that you get adequate nutrition. Make sure your diet includes protein and vitamin C. Ice cream, milk, and fruit juices are good sources of nutrients for healing. And keep the surgical site clean as much as you can. But you don’t want to disturb the sutures for a few days, so start by rinsing with salt water. A teaspoon of salt in a cup of water is about right for rinsing. Brush your teeth also, being sure you use a soft brush. After a couple of days, begin to brush the teeth furthest back, being sure not to disturb any loose tissue that has been sutured into place. Within a week, that loose tissue should be much firmer. A common healing complication of wisdom tooth removal is dry socket. This ordinarily occurs in about 10 to 15% of patients, and is much more prevalent in the lower jaw. With dry socket, healing progresses normally for about three days, and then there is a dramatic increase in pain coming from the socket and radiating to the ear. If this happens to you, call your dentist for treatment. There is a dressing that will ease the pain, and you may need additional prescriptions. Sometimes sharp edges of bone may surface as it heals. This doesn’t necessarily require treatment. It occurs because, after the extraction, your body begins to work to reshape the soft tissues and bone in the area formerly occupied by the tooth. Unless the edges cause serious discomfort, it would be best to leave them alone, and the healing processes will smooth them out. If necessary, your dentist can smooth them out or trim the edges. I would not expect any extra fee for any of this routine post-operative care. The roots of lower wisdom teeth may lie near the main nerve to the lower jaw, and their crowns may be near the nerve to the tongue. During the surgery, these nerves could be damaged. This happens in maybe 1% to 2% of cases. The result would be numbness in the lips, chin, and teeth on the side affected, or in the side of the tongue. Movement would not be affected—only sensation. If this happens to you, call your dentist immediately. It may also be possible that the nerves were not touched during the surgery, but there is swelling that is pressing on the nerve, causing it to go numb. In this case, a prescription of anti-inflammatory medication can ease the damage to the nerve and make recovery quicker. If you do have nerve damage, expect some difficulty in using your mouth for several weeks, until it accommodates to the change. The nerve may take a month or several months to repair itself. It is not very common for this numbness, if present, to be permanent, but that is also possible. If the nerve was actually severed during the surgery, that is when the damage will likely be permanent. If the roots of your upper wisdom teeth lie close enough to the wall of one of your nasal sinuses, your sinus wall could be perforated during the operation. If that happens, you would notice bleeding through your nose after the surgery. Call your dentist, who can advise you on how to care for it until it heals. Your dentist may want to perform a minor post-operative surgical procedure to close the hole. In rare cases, the wall between the tooth and the sinus can be so delicate that attempts at extraction cause the tooth or a piece of the tooth to be displaced into the sinus. If this happens, the piece or tooth should be surgically removed to prevent later sinus infections. The degree of risk of complications varies from patient to patient and increases greatly with age. If you are over age 25 or 30 when the impacted teeth are removed, you have a greater chance of complications, because of the increased density and reduced flexibility of the bone. If you have your wisdom teeth removed before their roots are completely formed, the risk of complications is usually minimal. The position of the teeth in the jaw and the difficulty of the surgery also affect the degree of risk.